You can also perform a more selective search for churches in the Starston area or see them printed on a map. Daybook of Thomas Arrowsmith, Rector of Starston 1726-1728. Mural Paintings in Starston Church, Norfolk. Index of Marriages, Starston, 1561-1753. 1688-1689, 1729-1730, 1755-1758, and 1773-1783. For the civil registration of births, marriages and deaths between 1837 and 1930 (and for the censuses from 1851 to 1901), Starston was in Depwade Registration District. A life in Starston: memories 1909-1980. Ask for a calculation of the distance from Starston to another place. Starston is in Earsham Hundred. You can see the administrative areas in which Starston has been placed at times in the past. Select one to see a link to a map of that particular area. 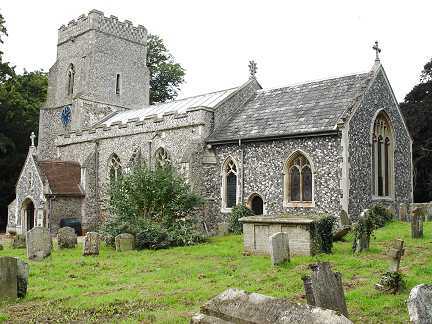 Some Account of the Parish of Starston, Norfolk, compiled chiefly from the Ancient Registers by the Rector. Names of the people who took part. After 1834 Starston became part of Depwade Union, and the workhouse was at Pulham Market (Pulham St Mary Magdalen). 1747, 1761, 1801, and 1815. Weekly payments to the poor, payments in sickness, payments to tradesmen, etc.